“Surely sharpening a knife can’t be that hard” one might think, as they destroy the edge on their pocket knife by flailing it wildly against a whetstone of indeterminate grain. In reality, knife sharpening is as nuanced a practice as virtually any other field, and getting a quality finish is much harder than it seems. It also gets increasingly complex with different blades, as [Turbo Conquering Mega Eagle] shows with is customized knife sharpening jig. The hardest part in any blade sharpening is getting the proper bevel angle. A heavy angle is good for heavy-duty tools like axes, but for fine work like shaving a more sharp angle is required. Usually, a table-mounted jig is required but due to production constraints, a handheld one was used. It’s made with push rods and a cam follower from an airplane engine (parts are plentiful since this particular engine breaks all the time) and can impart very specific bevel angles on blades. For example, machetes have a heavy angle near the handle but a finer point towards the tip, and this tool helps streamline sharpening many knives quickly. If you want to try your hand at another project that’s not as straightforward as it might seem, you might want to build a knife from scratch before you make an attempt at a sharpening tool. It’s just as nuanced a process, but with a little practice can be done with only a few tools. How do you feel about Jello? It’s alright tasting, but it’s much more about how jiggly it gets. Nobody — probably — would eat Jello if it was a hard candy. It would quickly become restricted to the bowl of strawberry candies that Grandma always seems to have. How do you feel about knives? We’re on Hackaday. Most everybody here has at least a couple in their toolbox. Some of them have more than a couple, including the whetstones to sharpen them. It’s safe to say they probably like the concept. Now, what if you could combine the two? Two favorites are always better than one. A Jello knife, while seemingly impossible, would be rather impressive, and [kiwami japan] does just that, as well as so much more. He starts with a couple dozen adorable Jello snacks (Jellos? ), and from the wiggliest of foundations, he builds a masterpiece. The first order of business is to eat a couple of the stragglers while he decides what to do with the rest. A bit of blue food coloring, some more gelatin, and the help of several cow shaped bowls and pitchers later, [kiwami japan] has melted the survivors down and gotten a flat sheet. Once sufficiently cooled, it makes a nice knife-shaped Jello blank. Few things are as frustrating in the kitchen as a dull knife. [Becky] and her chef friend collaborated to build a Bluetooth module to tell you when you are sharpening a knife at the optimum angle. That might sound a little specialized, but the problem boils down to one that is common enough in a lot of situations: how do you tell your exact orientation while in motion? That is, with the knife moving rapidly back and forth over the sharpening stone, how can you measure the angle of the blade reliably? Looking for a challenge, [Becky’s] first attempt was to just use an accelerometer. It worked, but it wasn’t very precise. Her final answer turned out to be a full inertial measurement unit — the BNO055 — that combines an accelerometer, a magnetometer, and a gyroscope along with enough smarts to fuse the data into actual position data. We all know the feeling of an idea that sounded great when it was rattling around in our head, only to disappoint when we actually build the thing. It’s a natural consequence of trying new stuff, and when it happens, we salvage what we can and move on, hopefully in wisdom. The thing that at least semi-defeated [This Old Tony] was an attempt to build an ultrasonic cutter, and it didn’t go well. Not that any blood was shed in the video below, although there seemed like there would be the way [Old Tony] was handling those X-Acto blades. 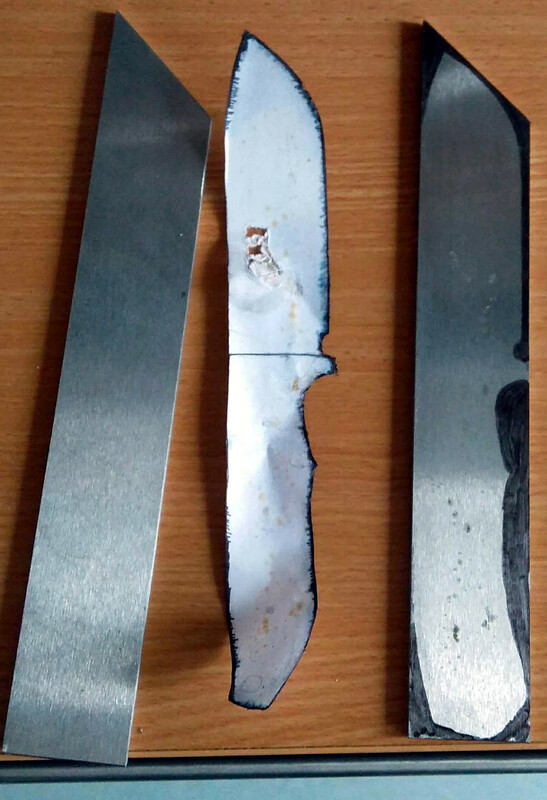 His basic approach was to harvest the transducer and driver from a cheap ultrasonic cleaner and retask the lot into a tool to vibrate a knife rapidly enough to power it through tough materials with ease. Spoiler alert: it didn’t work very well. We think the primary issue was using a transducer that was vastly underpowered compared to commercial (and expensive) ultrasonic cutters, but we suspect the horn he machined was probably not optimized either. To be fair, modeling the acoustic performance of something like that isn’t easy, so we can’t expect much. But still, it seems like the cutter could have worked better. Share your thoughts on how to make version 2.0 better in the comments. The video is longish, but it’s as entertaining as any of [Old Tony]’s videos, and packed full of incidental gems, like the details of cavitation. We enjoyed it, even if the results were suboptimal. If you want to see a [This Old Tony] project that really delivers, check out his beautiful boring head build. It seems like everyone is building belt grinders these days. You might think [Jeremy Schmidt] is just hoping on the bandwagon, but you’d be wrong. He took a full two years to design the perfect belt grinder for his needs. Now he’s built his perfect beast, and we must say, it’s quite impressive! [Jeremy] had seen grinders which can tilt, but most of them tilt the entire machine, including the table. He designed his machine with an independent table. This means the belt can be placed at any angle, while the table remains flat. He’s achieved some really interesting finishes with a course grind on a 45-degree angle to the workpiece. No build is without its problems. In [Jeremy’s] case it was building the box which acts as a receiver for the machine and the tables. Regular square tube stock wasn’t quite rigid enough, so bar stock was the way to go. The first attempt at building the box resulted in a warped tube, due to the stresses of welding. [Jeremy] was more careful the second time, moving from section to section of the four welds. This kept the heat from building up, and the box stayed straight. The final result is an incredibly rigid machine which definitely will withstand anything that [Jeremy] can throw at it. If you want to see more belt grinders at work, check out [Bob]’s treadmill belt grinder, or [Mike’s] conversion.